So many people are talking about “self care” right now. It seems simple enough, but it’s easy to overlook when we’re busy with work, taking care of our loved ones or doing many of the other things that life throws our way. According to Psych Central, self care is defined as “any activity that we do deliberately in order to take care of our mental, emotional and physical health.” They explain that good self care is essential to lower anxiety and improve your mood. It also promotes good relationship with yourself and others. This goes to show that every day is a good day to practice better self care. To help you get started, we’ve put together a set of wellness printables to help you practice better care. A self care checklist is a great way to see what type of care you prefer. Once you determine what your habits are, it’s easier to see what steps you can take to improve. Peruse our self care checklist and wellness printables to see how you can make conscious efforts to take care of yourself every day. Everyone is unique and responds to different types of self care. A night out with friends can sound fun for you, but may be mentally draining for someone else. For that reason, our self care checklist focuses on different types of self care. Some of these types overlap, and you may prefer multiple types of self care or prefer different types of care in different scenarios. Take a look at the different types of self care below to get a better idea of the differences and similarities of each one. Physical: This includes practices that affect your physical wellness like getting enough sleep, eating well and exercising regularly. Emotional: This includes self awareness of your feelings and knowing how to manage them, like reducing stress and saying positive affirmations. Mental: This includes stimulating your intellect and creativity like trying new things that challenge you positively, doing puzzles and crosswords or reading a book for pleasure. Spiritual: This includes following your personal beliefs for a deeper understanding of yourself and others. It also includes our connections with things that are bigger than ourselves. Social: This includes connecting with others who support you or bring you joy. Look through each item in our self care checklist and note how each of these different ideas and activities make you feel. This isn’t an exhaustive list, but it should give you a good starting point and a better idea of your self care style. How did I feel while filling this out? Overwhelmed? Indifferent? Proud? What surprised me? What didn’t surprise me? Why? What are some self-care practices that I feel I should be doing more of? What’s stopping me from doing them? Why do I think I like certain practices more than others? Do I like certain types of care in different situations? Which ones? The next step is to pick a few ways you want to practice better self care every day. Some people feel better after a quiet night in with some sweets, while others enjoy playing soccer at the park with friends. Others feel the most joy when they do random acts of kindness. We picked out a wide variety of fun and unique activities so you can see what works for you. It’s a great starting point to see what kind of things you enjoy and what activities aren’t as interesting. If you already have a good grasp of the things you’d like to do, we included a blank sheet you can fill out everyday to get yourself organized for your day. If you want to fill these out but don’t want to print out multiple copies every day, laminate this page or slip it in a plastic sleeve. You can use a dry erase marker to write and erase every day. For times when you feel a little down or overwhelmed, take a look at our tips on ways to help someone having a bad day to turn your day around. If you’re still looking for ideas, you can check out our post on stress relief activities for even more things to try! Now that you have a better grasp of your self care style and a few activities in your back pocket, it’s time to keep track of how you’re feeling. 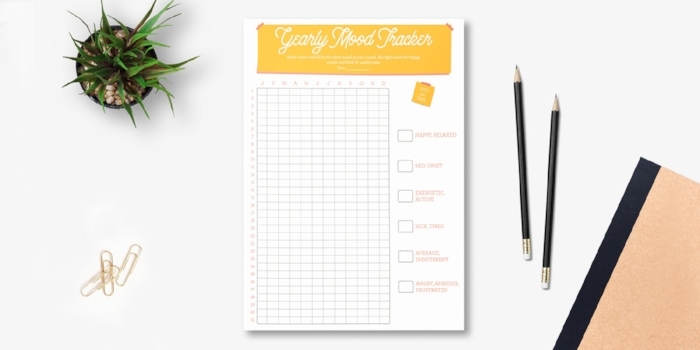 A mood tracker is a great way to track your mood over time, so you can get a better idea of when your mood fluctuates. We have a yearly mood tracker and a monthly mood tracker so you can choose what tracking style works best for you. A yearly tracker is great if you’d like see your progress over a long period of time, and the monthly tracker is helpful if you want to reflect every month to adjust your self care practices. Keep in mind that there’s nothing wrong with not feeling happy every day! There are always periods of time where we may feel sad, upset or anything other than happy. It’s important to remember that all feelings are valid regardless of how positive or negative they are. Don’t feel like you have to be happy all the time, but remember not to dwell too much on any negative feelings! Take the time to reflect and process your feelings, negative or not, so you can have a better understanding of yourself and where those feelings come from. This way, you’ll have a better idea of how you can cheer yourself up when you’re down and what you can do to help yourself feel happy. You’ll also have a better idea of what gets you down and what you can do to process and cope with those feelings. To learn more about how to boost your mood, take a look at our guide to cheering someone up for a few science-backed mood-boosting activities. The most important thing to keep in mind is that printables and tips like these are ways to improve your overall well being. It’s okay if you don’t feel like you’re at your best after trying a few of these tips. Self care looks, feels and sounds different for everyone! Keep trying different things so you can practice self care in a way that works best for you. If you want to take your self care even further, take a look at our list of happiness and wellness practices around the world to see how other cultures practice positive wellness. Don’t forget to reward yourself whenever you know you’re doing a great job. New shoes, a night out with friends or some yummy dipped berries are a few ways you can give yourself a well-deserved pat on the back. SpunkyDiva Diaries aims to bring you the best information available. We are always pleased when we’re approached with valuable resources that can help our #SpunkyDivaTribe and support our mission. So, thank you Shari’s Berries for contacting us with these #SELFCARE tools! We hope to partner up and work with you all more in the near future.